Blush pink bridal dupioni silk fabric. Brand New High-End Dupioni Silk Fabric Yardage. 55 inches wide. 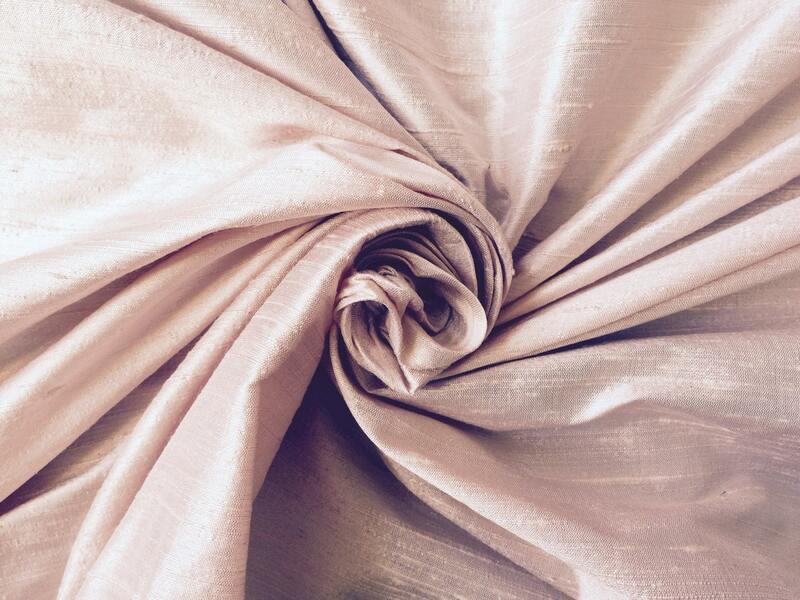 This silk fabric is the exact shade of blush pink brides look for and is perfect for a blush pink wedding! If you want to order a 2 inch x 2.5 inch dupioni fabric swatch to see the exact color, contact us. Swatches will be $1.50 per swatch including shipping. You can contact us for a custom listing or for a wholesale inquiry of 3 or more bolts opening order. We reply to questions quickly because we check our messages very often so do not hesitate to ask us. *1 to 3 yards $31.99 per yard + your shipping charge covers 2 to 3 days First Class shipping in the USA or First Class International service. *4 to 9 yards $31.99 per yard + your shipping charge covers 2 to 3 days Priority Shipping in the USA or First Class International service. $30.99 per yard for USA and for international customers. Ask us for international shipping quote. Very nice and a beautiful color!!!! Beautiful blush color and fast shipping!